Like a lot of the highways in Saskatchewan, the road from Saskatoon to The Berry Barn is a straight shot from one horizon to the other. It runs through fields of lush green plants in rich brown soil under a clear blue sky that stretches out in every direction. The Land of the Living Skies, Saskatchewan is called, and the name fits, especially on this warm midsummer day. En route, we pass fields of strawberries, vegetables, pumpkins, and corn. In some, industrious U-pickers stoop over, filling pails with fruits and vegetables. Greenhouses, produce stands, farm houses, and the occasional tractor slide past. I open the car window and breathe in an organic mix of earth, plant life, and recent rain. After several miles we arrive. 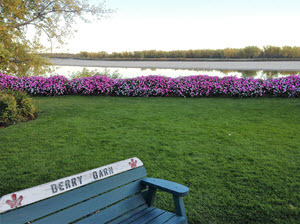 The Berry Barn is a red, hip-roofed building at the end of long rows of towering poplars, a vintage prairie wind-charger on one side, an antique grain wagon on the other. Planters overflow with multi-colored petunias, geraniums, and begonias. A greenhouse and open-air garden shop beckon. Behind that stand rows of 12-foot Saskatoon berry bushes — the U-pick orchard. Want to pick a couple of pails of Saskatoons to nibble on, to preserve, or even to put in a pie? Grab a pail and head for the orchard. Want the berries, but not up for the picking? No problem. Pay a little more and take home pre-picked berries. Want to sample, but don’t want to wait? Indulge in a piece of homemade Saskatoon pie in the restaurant, along with a cup of gourmet coffee. (You can also buy a whole pie and take it home.) Try the waffles, and take a trip to the topping bar. It includes (you guessed it!) Saskatoon berry topping as well as several other choices. The restaurant features a sunroom with roll-up window sections that bring in fresh air and the scent of flowers. Petunias are everywhere. The river flows by silently. Paths lead away, calling us to wander the property. So we do. After the meal, we roam the gift and garden shops, stroll along the riverbank, take pictures, explore the event facilities. 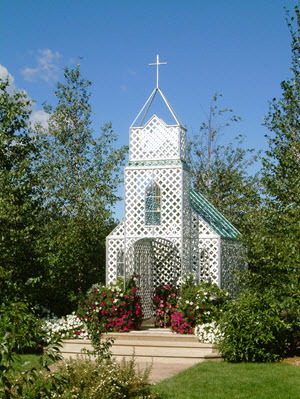 They stand apart in a garden with a small outdoor chapel, a shady deck, and a reception tent. The gift shop is packed with homey crafts, plaques, candy, and (not surprisingly) Saskatoon preserves and syrup. The garden shop offers an amazing variety: everything from a delicate garden butterfly to a nine-foot giraffe. We browse, we enjoy, sometimes we buy. Eventually we head home. It’s a mini-getaway. Not a vacation, but a pleasant, satisfying, and entertaining diversion. Chances are we’ll be back. I never get enough of that Saskatoon pie. 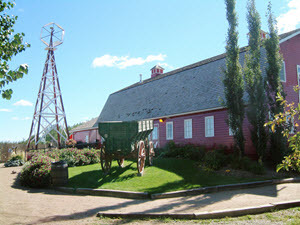 The Berry Barn is located seven miles south of Saskatoon, Saskatchewan, on Valley Road. The restaurant is open seasonally, from April to December, Monday to Friday from 11 a.m. to 8 p.m. and Saturday and Sunday from 9 a.m. to 8 p.m. Call (306) 978-9797 or email theberrybarn@live.ca.